Transform your smile with invisible braces! At Beautiful Smiles Dental Center, we can help you to regain confidence in the look of your smile with Invisalign braces. Many people are put off by the idea of traditional braces, causing them to suffer from misaligned teeth when they don’t have to. Traditional braces can be incredibly uncomfortable, with the brackets and wires being unpleasant for many individuals. Having to sleep, eat, and talk with metal braces can cause discomfort, no matter your age. Thankfully, Invisalign have developed an alternative solution to straightening your teeth, without any of the worries that come with the traditional metal system. These modern, advanced, and revolutionary braces make the process of straightening your teeth easier, more comfortable, and less worrying. 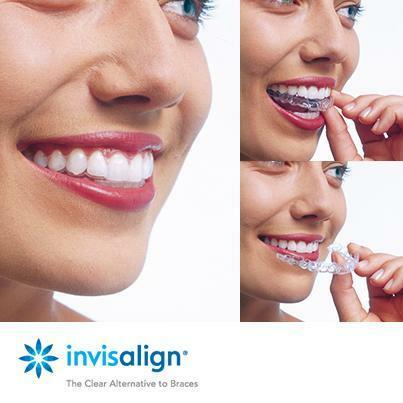 The new Invisalign braces are almost completely invisible, a stark contrast to the standard brace systems. Custom-made to fit the shape of your mouth, the braces are highly effective in cases of misaligned teeth, both minor and serious. They are also completely removable, for guaranteed comfort and ease of cleaning. Straightening your teeth is incredibly important for your overall oral health. Problems like open bite and deep bite can cause much bigger issues to occur, above and beyond the appearance of teeth that are not properly aligned. Gapped teeth can very quickly lead to ongoing problems with your gums. Overly crowded teeth can result in crooked teeth and the accumulation of plaque. Many of the problems, such as underbite and open bite, can also lead to abnormal pain when eating, or just going about your daily routine. Leaving these problems untreated can cause you to suffer undue pain, and potentially make the appearance and health of your teeth take a turn for the worst. When properly fitted by the Beautiful Smiles Dental Center expert team, Invisalign braces will work quickly to start transforming your smile. They are molded to your gum line and fit incredibly snugly in the mouth, so none of your day-to-day activities are hindered. With Invisalign, the whole system is subtle and understated, making it feel and look as natural as possible – often, you’ll hardly notice that you’re wearing braces at all! In the hands of the professionals at Beautiful Smiles Dental Center, each patient is ensured an Invisalign brace that is designed expertly to fit the shape of their teeth, and work optimally to realign the teeth in the most effective way possible. The highly customizable nature of the Invisalign brace completely transforms the dental care treatment, giving you a smile to be proud of – sometimes in as little as three months. While a few months or more may sound like a long time initially, the experience is nothing like what you would expect from normal braces. You don’t have to worry about wires poking into your mouth and causing irritation, and you have no restrictions on what you can and can’t eat. Not to mention, Invisalign aligners are much easier to keep clean, with no extensive flossing and brushing required, other than what is needed for good oral health. At Beautiful Smiles Dental Center, we want you to get the most back from your braces in as quick a time as possible. After all, however advanced the Invisalign system may be, nobody wants to be wearing braces any longer than what is needed to correct their teeth. To ensure that you get perfect results as quickly as possible, we provide an expert service that is capable of getting your braces redesigned every two weeks. This means that the Invisalign system is always perfectly designed to make the alignment quicker and better tailored to your exact needs. With the provision of a brand-new aligner every two weeks, you can see the best results happen before your very eyes. Invisalign offers a state of the art way to transform your smile with a precision treatment that targets what your teeth need to look better and even feel better. If you’ve dreamt about achieving that perfect smile, or you want to make sure that your children get the oral care they need to realign their teeth, then the professional team at Beautiful Smiles Dental Center are on help to help. Our extensively experienced team are fully trained to offer patients of Beautiful Smiles Dental Center in Chicago, the latest in orthodontic care with full access to the benefits of Invisalign. With a custom care plan, designed specifically for your needs, we’ll get to work crafting aligners that are perfectly sized to fit your teeth naturally. The smooth, comfortable Invisalign braces will then take over, helping to correct the alignment of your teeth as effectively as possible – offering optimum comfort and minimal intrusion every step of the way. At two-week intervals throughout the treatment, a quick appointment will be arranged so that you can always stay in front of your teeth realignment with an aligner that is the right size and shape for the stage you’re at. The comprehensive treatment plan, put together to match your needs by the team at Beautiful Smiles Dental Center, will work to deliver the smile that you’ve always dreamt of having. If you would like to learn more about Invisalign or would like to book a free consultation with one of our professional team in Gurnee, IL, please don’t hesitate to call us today on (847) 249-5700. With the right treatment, you can turn that dream of a beautiful smile into a reality! Copyright Beautiful Smiles 2019 | Sitemap | All rights reserved.